PRESS RELEASE:Born out of a combination of necessity and ingenuity, The BumChum is a small, highly portable solution to an age-old problem: We all know the feeling of the bottom end thump when we see a band from out front. Who usually feels that the least in the whole room? The drummer. The answer is a device that you are in control of, that delivers all the weight and power of your bass drum without the volume. 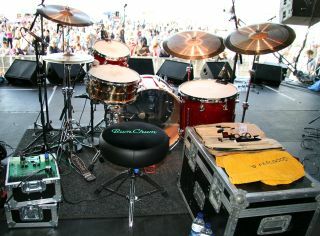 The revolutionary BumChum allows you to feel and experience your bass drum like you never felt it before. No longer are you dependant on the lottery of monitoring your bass drum (should any monitoring be provided), whether on a big stage, in your local pub with the bass stack in your ear, or rehearsing. No more hammering away, technique flying out of the window, in a desperate attempt to hear yourself. The BumChum consists of the most powerful Tactile Generator available, (used by the US military in their simulators), built into our very own throne top, coupled to a flightcased electronics pack. The BumChum system uses bone conduction to deliver powerful, precise and nuanced reproduction without sound. Audio techs (as well as your ears) love the system because the stage is quieter and more controlled. The band can tour with fewer amplifiers and sub cabinets, saving on weight, costs and stage space. If you're using in-ear monitoring, you'll be able feel the bass drum like never before. If you're not using in-ears, this system so accurately connects you to your bass drum that it will improve your confidence, playing and your whole stage experience. Better still, our clever techy guys have built the BumChum electronics to fit into a road rugged flight case the size of a 10" tom which only weighs 8 kilos. It is extremely portable and, most importantly, is quick and easy to set up. Simply open the case, plug in throne, plug in mic, plug in power and you're away. Max output: 150W RMS / 4ohm 0.05%THD 20hz-20khz +/- 2dB.